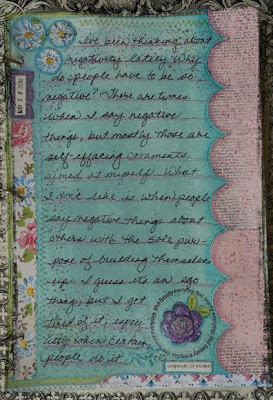 This is another page for my Art Journaling Without Fear group. We were asked to use rubber stamps for this assignment. I used stamps from Stampers Anonymous (scalloped ledger border), Ali Edwards (find beauty everyday), PSX (flower), Hero Arts (zig-zag stitch), JoAnn Fabrics (date stamp), Stamps by Judith (babies breath and scattered dots) and Stampabilities (vintage flourish). So were you a David Archuleta fan or a David Cook fan? I really liked them both, but felt that David Cook was the most marketable American Idol performer. I think he will go far. What a terrific journal page!! Love how you were able to incorporate so many great stamps. I agree with you on AI. I think they will both have amazing careers because they are very talented, but I do believe David Cook was the more marketable of the two and as is evidenced by the vote, appealed to many more people.